Porsche - its the marquee that gave the automotive world the holy three digit number - the 911. Porsche also gave the industry a lesson in timeless design. And just as these facets became holy scriptures for the worshippers of speed, Porsche unleashed a prophecy that would shape the future of performance cars. In a rally-bred 959, Porsche foresaw sportscar level of performance on a high riding car and that went on to redefine the meaning of 'Sport' in a sport utility vehicle. The modern-day bearer of this prophecy is called the Cayenne. In the last decade or so, SUV's have dominated the world automotive market and like them or not, but the likes of the Bentley Bentayga, the Maserati Levante, the Lamborghini Urus, its soon-to-be-born enemy from Modena-based Ferrari, and the army of AMG, S, and M-badged SUVs from Germany, are all conceived from the same idea. Their ability to combine racetrack-worthy performance with everyday practicality and a certain degree of bad road capability, keeps the cash registers ringing for their makers. 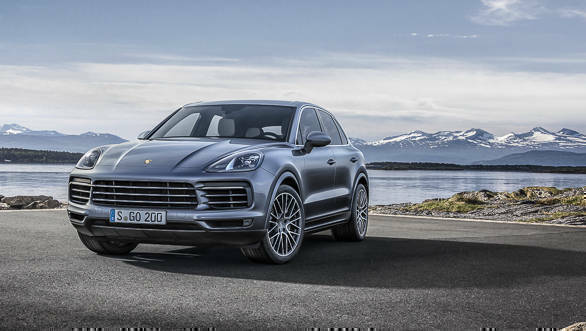 While many are still playing catch-up and trying to fine-tune the concept, Porsche has already readied its third-generation Cayenne. Though many Porsche purists still cringe at the idea of an SUV with a flag of Stuttgart on the bonnet, the Cayenne is a very important car. With more than 300,000 of them sold already, there is no denying that it brings in the big bucks for the brand and those healthy earnings mean that you and I can continue enjoying new and improved 911s quite often. Lets give credit where it's due, because the Cayenne never bet solely on its SUV body style. 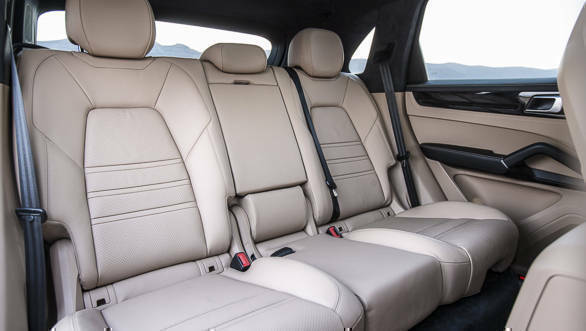 Inside the tall and heft, it is just as advanced as you would expect of a Porsche and more fun-loving than the Bentley Bentayga or the? 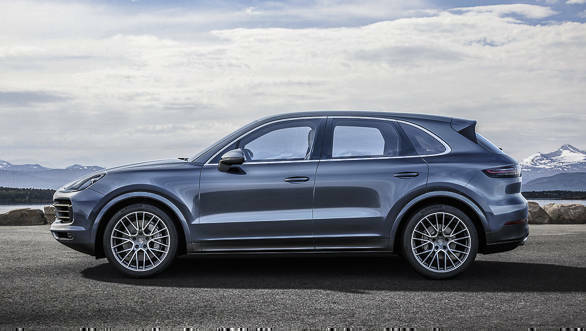 Audi ?SQ7 - the cars that it shares its basic platform with. In typical Porsche fashion, the design is evolutionary and hard to differentiate from the outgoing model. 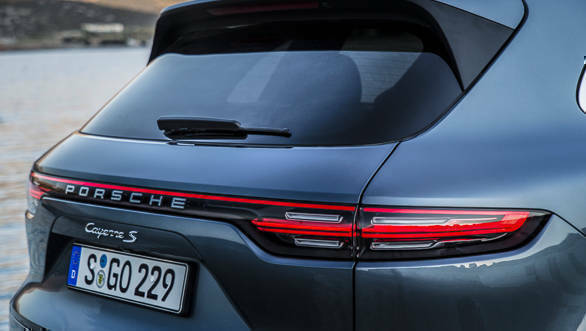 Look at the boot for the seamless strip of glass enveloping the Porsche lettering and connecting the sleek LED tail lights, and you will know it's the new Cayenne. That strip also highlights the broad shoulders of the new model. Unlike typical Porsche designs, where the bonnet is placed lower than the headlights, the new hood sits in line with them. Like the previous model, the new headlight layout too has four LED daytime running lights, but these are much larger in size and squarish in appearance. The bumpers retain the three-pot layout but have tighter shapes for the air intakes and cooling ducts. The glass dome in the central dam for the road monitoring cameras and sensors looks a bit ungainly though. 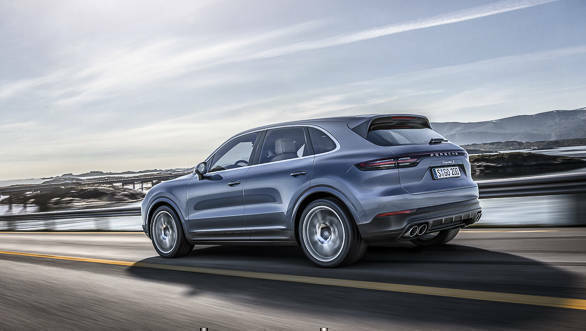 The Cayenne's roof has been lowered by one centimetre while the wheel sizes have gone up by an inch (across variants) and that along with the tighter lines make the overall profile? o?f? the Cayenne look athletic and significantly more compact than the rest of the lineage. Climb into the cabin and it still feels like a high riding SUV, giving you a commanding view of the road. What you will notice is a much cleaner centre console. Pressure touch switches like in the new Panamera replace the conventional switchgear and reduce visual clutter. The gear selector is more compact too. 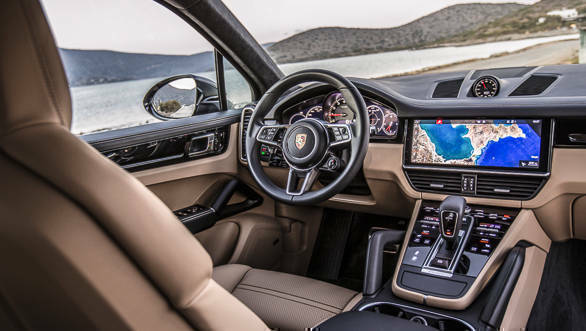 A 12.3-inch infotainment screen dominates the Cayenne-typical vertical profile of the dashboard and grabs attention away from the trademark Porsche clock on the dash. It's almost like having a netbook computer stacked into the dash. The software feels like it too - allowing you to customise layouts, install your own apps and stream entertainment off the internet. The interface is easy to learn and doesn't need you to take your eyes off the road often. I love the new instrumentation too! A large analogue tachometer is flanked by two 7-inch digital screens that can display sat-nav maps and infotainment data or simply mimic the five-pot instrumentation of yesteryear Porsche cars, to keep the purists happy. With the responsibility of Porsche's Indian operations stemming at Porsche Middle East, we were invited to Fujairah near Dubai to meet and drive the new Cayenne. I went in hopes of going dune bashing with the car, but our drive was designed to track alongside the seashore and crossing borders to enter into some arid mountains in Oman. The latter was a literally a replica of the Ladakhi terrain, minus the the oxygen-deprived altitude. Interestingly, the land is full of Japanese and American cars with an occasional Mercedes-AMG ?G-wagon or Land Rover sighting. So it wasn't a surprise that the Cayenne looked alien to most onlookers, but their gestures suggested that they liked what they saw. In places like Dubai, Mumbai and other cosmopolitan areas, the new Cayenne will fit in just fine like its predecessors did. Smooth tarmac always puts a smile on the Cayenne's face and our drive route rolled out plenty of it for this vehicle?. The new turbocharged V6 petrol engines in both, the Cayenne (3.0l/340PS/450Nm) and the Cayenne S (2.9l/440PS/550Nm) sing melodiously to their 6,000+ rpm redline. The S sounds better with its four pot sports exhaust. Neither of these engines feel turbocharged and pull in a strong, linear manner. The bi-turbo engine in the Cayenne S just feels more eager with more on-tap power even when driving in the Normal mode. Sport and Sport Plus modes make response ?much ?sharper? of course?. The performance gain of these engines over the outgoing units is quite marginal to notice in everyday use, but the new engines run cleaner and are more efficient the way they burn the fuel. You get a rotary driving-mode selector on the steering wheel, and a little boost switch at its centre that gets you into Sport Plus mode temporarily (for 20 seconds?). It's ideal for ?quick ?overtakes or childish joys like attacking an empty roundabout, without having to change modes. I like it! The boost switch only alters the engine characteristic, as sudden changes to the chassis behaviour may not be a safe bet every time. Choose the Sport or Sport Plus mode manually though and the optional adaptive suspension will stiffen up to impart tauter dynamics. Apart from maintaining a near flat ride through corners, it also lets you raise the body for going off the beaten path. For the latter, the Cayenne has some finely tuned toys too. It gets two lockable differentials which will alter their behaviour depending on the presets you choose - gravel, sand, snow etc. Electronically controlled Hill Climb and Descent assists are your best friends in the tough terrain. These can be engaged using a mode selector and the cruise control stalk and unlike some other similar systems, which get deactivated the moment to dab the brake pedal, Porsche's system remains alert and re-engages automatically the moment you let go off the pedal. So even if you were to suddenly approach a steep gradient, the car should be able to take care of the tricky work. Since it works in tandem with the radar-guided cruise control, it can even come to a complete halt while descending to avoid collision with the car in front of you - which is a big boon when driving the trails in a group. A previous generation Cayenne was our lead car through the trails around Ziggy Bay in Oman and it tackled terrain in a dignified manner too. But it is the always alert (yet discreet) electronics on the new Cayenne that give it an edge over the outgoing car and make life easy for the driver. 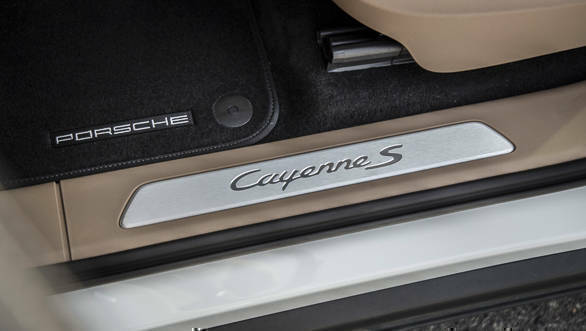 The Cayenne also comes with Porsche's hang-on four wheel drive. Unlike a conventional four-wheel drive system, where the front wheels always receive a certain amount of power even if you don't need it, Porsche's system can transfer 100% of the power to the rear wheels for more driving fun. Off the road, the system will provide power to the wheels with maximum traction to ensure easy movement. On the gravely routes in the mountains of Oman, the system worked quite discreetly and never did I feel any slip of either of the wheels. 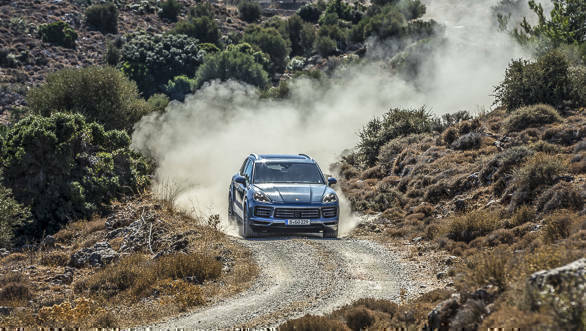 As I mentioned earlier, the terrain was very similar to some of the trickiest roads in Ladakh and I believe that would probably be the worst terrain any Porsche owner would drive their Cayenne to. So i?n? that sense, the Cayenne's off-road capabilities seem commendable considering it runs on road-biased tyres. How they perform when the terrain gets trickier in wet, remains to be seen when the new Cayenne arrives into India this monsoon. On the road, the tyres are an absolute delight. They seem to have never-ending grip and Porsche's near perfect dynamics are the sweet icing on the cake. The car now also feels lighter to drive than before, courtesy of the aluminium diet that forms 47% of its chassis construction and drops the weight by up to 65kg depending on the variant you choose. The Cayenne also ?comes with? the acclaimed rear-axle steering which makes it agiler. Porsche lets you opt for its new tungsten-carbide coated disc brakes which have better friction, lesser fade and brake dust, and a mirror-finish appearance, compared to conventional cast iron brakes. O?n our drive ?we ?didn't push the limits of either types of brakes to identify any operational difference. But if you belong to a rare (but expanding) breed that takes SUVs to the racetrack, you might want to opt for these Surface Coated Brakes which are second only to the track-bred carbon ceramic brakes. Either way, the Cayenne is usually bought by those wanting superiority in driving dynamics over the other luxury SUVs and crossovers in the market. 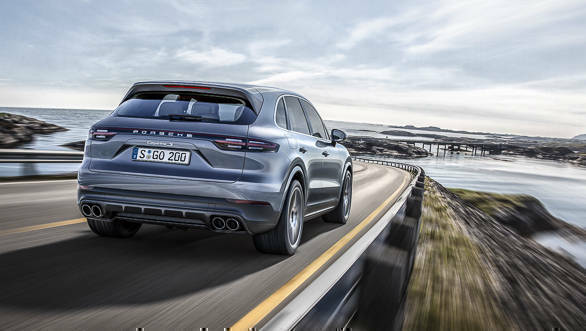 After our drive on the highway, mountain roads and on the rough surface, it would be safe to say that the new Cayenne is more fun and dynamic than before - and that is good news for its target audience. The better news is that the base or the S variants we drove could be the last ones to arrive into India - for the new model begins its Indian innings with the Cayenne Turbo, which packs a 4.0l bi-turbo V8 with 550PS of power and 770Nm of torque at its disposal. Now that, is something that we can't wait to drive!